While I was in Crete, I was flipping through a copy of the British Grazia-magazine, when I saw this gorgeous ring from Jewel Heritage. If you're a regular reader of Shark Attack, you must know that I'm a big fan of big, chunky, golden jewelry. 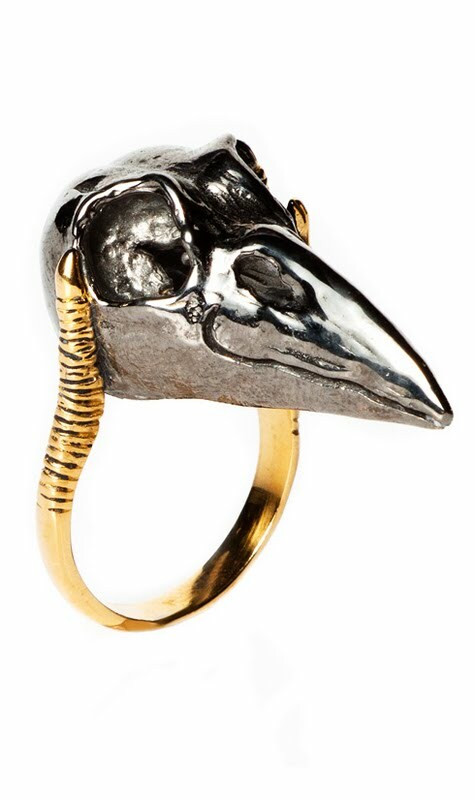 When I saw this ring, called the 'Harbinger of Death' (how cool is that? ), I could already imagine it on one of my fingers. Jewel Heritage was founded by two sisters which get their inspiration from death, symbols, mythology ... resulting in super cool jewelry. Being a total history geek, mythology and symbols have always intrigued me but I'm aware that these jewels may not be everyone's cup of tea. And which makes it even better: their jewelry is absolutely affordable! The ring above costs £ 60 - Not bad, right? Now, lets hope my mom will give me her credit card so I can buy this beauty, since she thought the ring was scary and gave her goosebumps. i love the combination of the gold and the silver metal! i haven't bought anything like that, but i must say that i totally see you wearing it! how are things going with the bracelet?